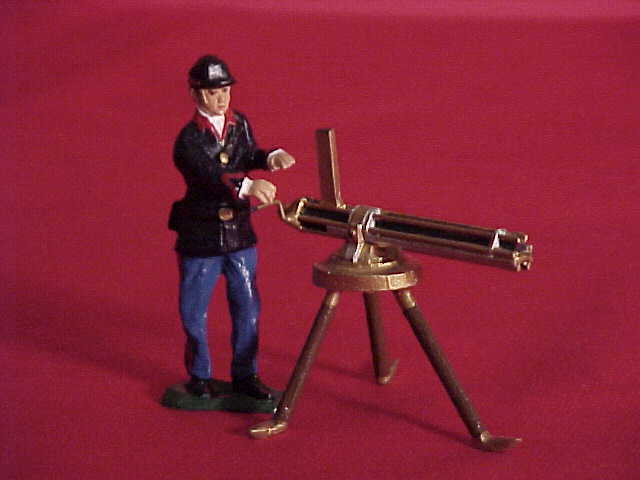 We deal primarily with the sale, customization and conversion of 54 mm toy soldiers manufactured by the LeMan's Collection. This collection includes numerous poses and accessories (forts, bridges, tents, walls, etc.) 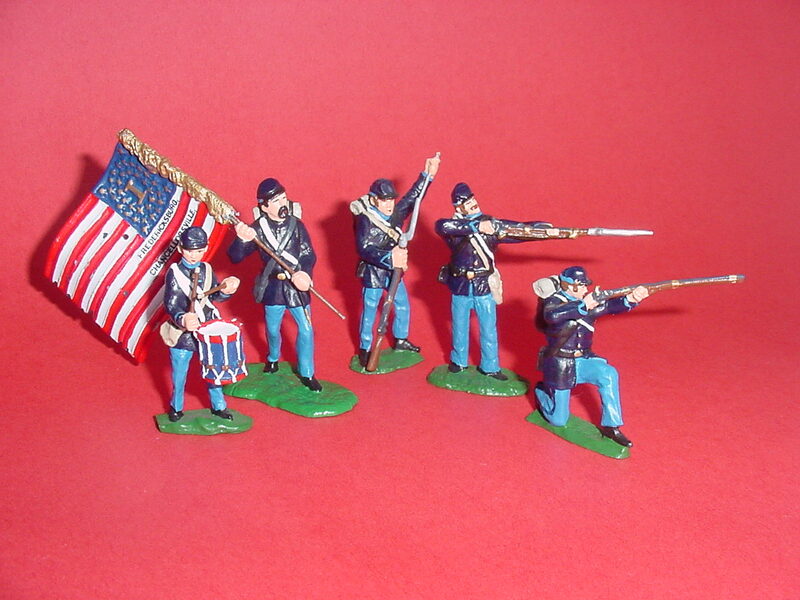 for use in dioramas depicting American historical periods such as the Revolutionary and Civil Wars, the French and Indian War (Trappers, Iroquois, etc. ), Plains Indians Wars (Buffalo Soldiers, Indians, 7th Cavalry, etc.) and the Texas War for Independence (Alamo combatants). Some accessories (wells, tools, wagons and bridges, etc.) can be used for other wars like World War I & II as well as domestic scenes (farms, villages, etc.). Recently, we added the highly detailed figures manufactured by Troiani Historical Miniatures (THM) and Schleich to our product line (See links at the side of this page!). All items discounted & sold individually. Both Union and Confederate artillery-men were distinguished by red ornamentation on their pants and collars. 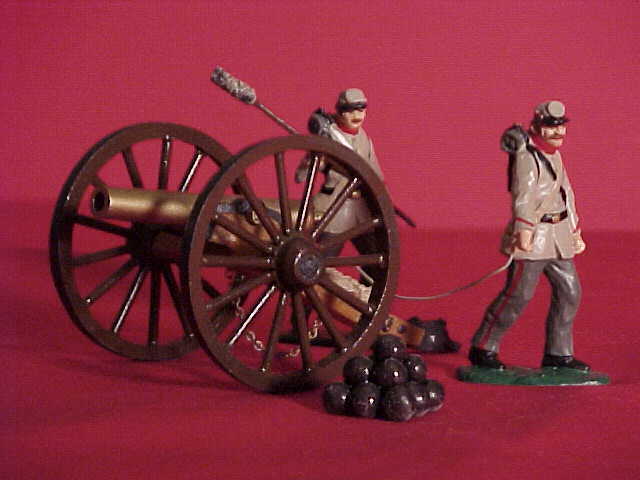 The LeMan's Civil War Collection includes other cannons (Dahlgren, Parrott, etc.) and mortars (Dictator & coehorn) as well as several artillery accessories such as walls, swinging gates, ramparts, limbers, forts, etc. Cannons come with a sponge and bucket. Artillery officers, casualties, sponge men, shell holders, bucket carriers, etc. are available in a variety of poses. Civil War cavalrymen were identified by yellow ornamentation on their pants and collars. 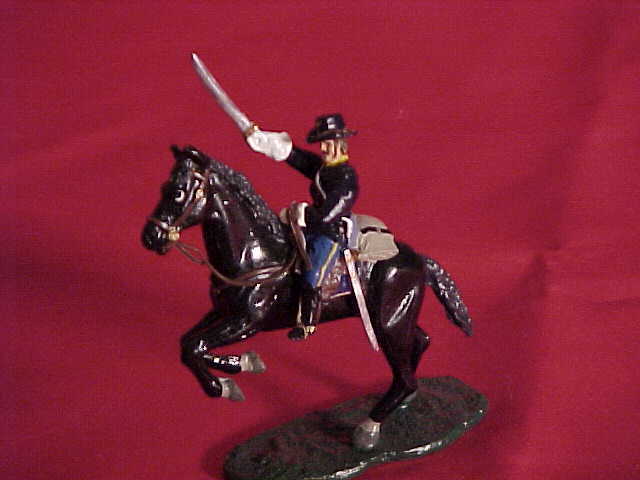 Collectors have the choice of several horse colors (brown, black, grey, palomino) and action poses (charging, trotting or standing with their riders equipped with swords, pistols, rifles and a variety of flags). Hat options are described below. pages below marked with stars!